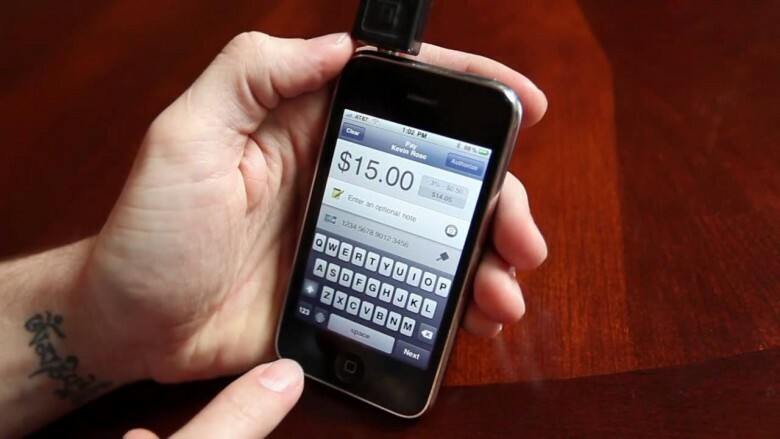 Digg founder Kevin Rose has become an investor of the Square iPhone payment system (which was in turn created by another social networking visionary, Twitter co-creator Jack Dorsey), and so he’s posted an informative video tour of the technology on YouTube. The pitch is great: Square allows anyone to take credit card payments on their iPhone, just by purchasing a cheap card swiping dongle and the Square app. Square takes a slice off the top and passes the rest of the money onto you. This technology isn’t just aimed at the small businesses: you could use it to collect rent, donations, loans from your parents, blackmail money, you name it. The technology also looks good. An amount is entered, a card is swiped, a signature is taken, and then an email is sent to the customer along with the GPS co-ordinates and Google Maps location of where the purchase took place. It doesn’t seem like a system that is optimized to turn around transactions quickly — the signature and email entry portions of the process seem likely to hold up a line — but it works about as well as can be expected. Security is the biggest, most obvious concern I have about Square. I have no doubt Square itself is on the up-and-up, but I don’t know that I would be particularly willing to hand my credit card over to a stranger walking up to me with a cheap plastic dongle sticking out of his iPhone. What’s stopping someone from jailbreaking their iPhones and programming a dummy app that looks like Square, but just records the credit card numbers? Even if the Square system is a totally secure way to make credit card payments, the iPhone is a vulnerable platform, and that’s worth some worry.